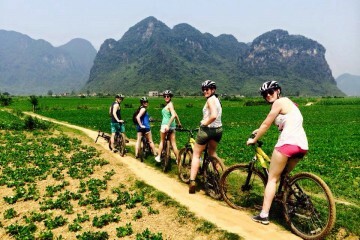 You will discover the charm of Ninh Binh by bike as you visit Van Long Nature Reserve, Cuc Phuong National Park, and Tam Coc and Bich Dong. This trip makes for a truly unforgettable experience, as you pass between towering limestone peaks, rice fields, lotus flowers ponds and local villages. As you cycle along the local roads between villages, you’ll have the chance to meet local people, see their daily lives and often have a cup of tea and chat with them. This two-day excursion is for all types of travelers, including families and small groups. You will stay at the best available hotels in the region. Further, you will be fully supported by a van and a guide who is a cycling enthusiast with extensive experience a passion for providing top notch service. Our bikes are top quality, lightweight, and can be adapted according to the terrain. We can also accommodate all sizes of riders, including children. 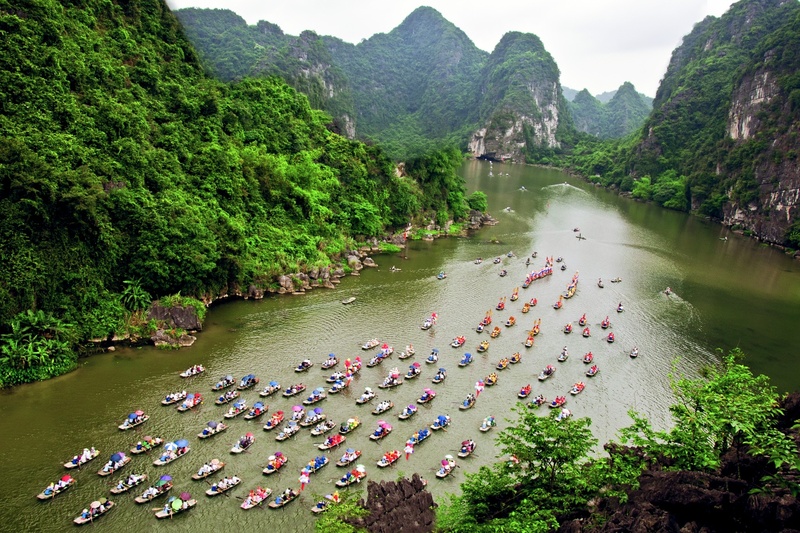 + Staying away from the city’s noise for a peace-of-mind journey discovering Ninh Binh’s impressively natural attractions. + Scenic boat tours along “Halong bay on land” to sightsee pristine natures of limestone mountains & hidden caves in the UNESCO heritage of scenic Trang An Landscape Complex & picturesque Tam Coc area. + Peaceful walk to view primitive natures in Cuc Phuong National Park. + Pay a visit to Hoa Lu ancient capital of Vietnam in 10th,11th century – interesting insight of the country’s history in the first state of a united nation Dai Co Viet. 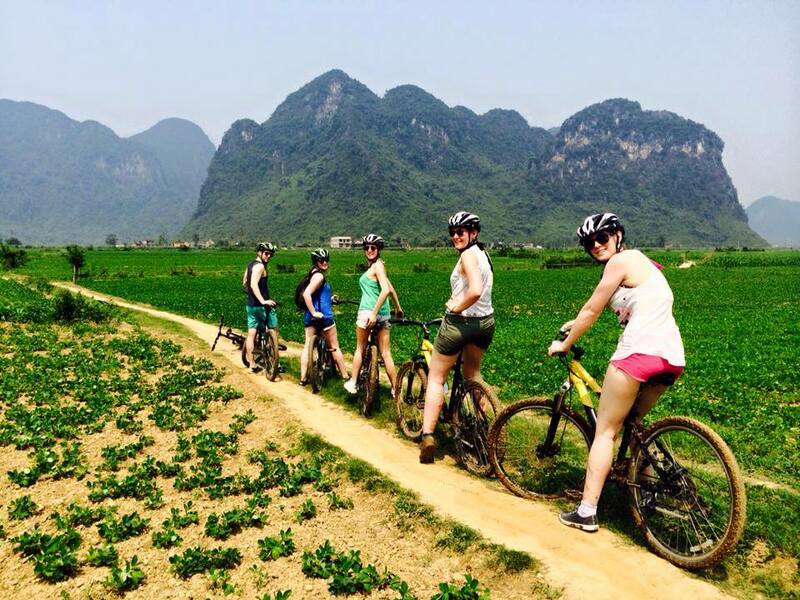 + Leisurely biking trip deep into the core area of “Halong bay on land, to visit top Ninh Binh highlights and admire breathtaking landscapes of limestone mountain settings & local villages. 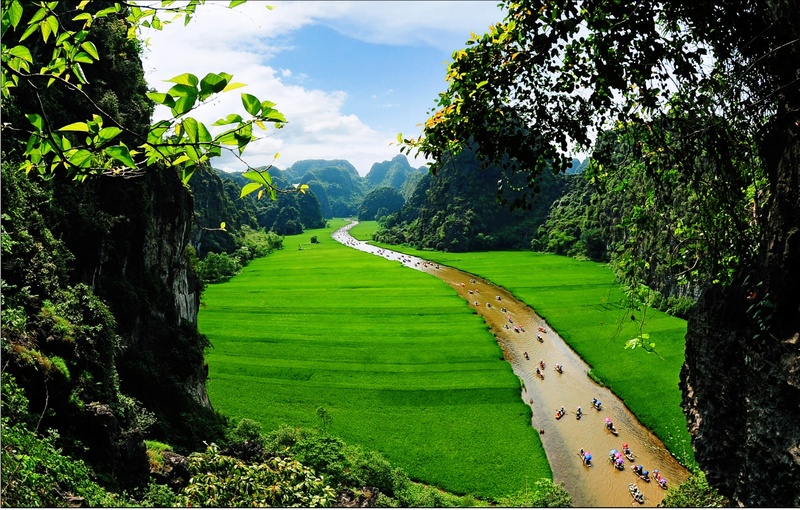 + Panoramic captivation of Ninh Binh’s scenic landscapes in a trekking route with steps to Van Long wetland. 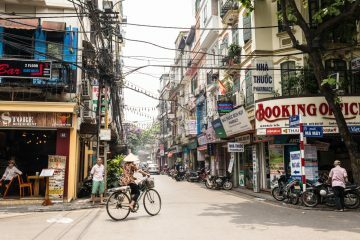 You will be picked up at 8:00 am at the hotel and leave Hanoi for a two-hour drive along Highway One (formerly Mandarin Road). 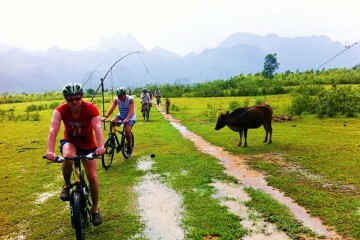 You will start cycling from Dich Long Bridge and bike on the dyke of Van Long Nature Reserve. 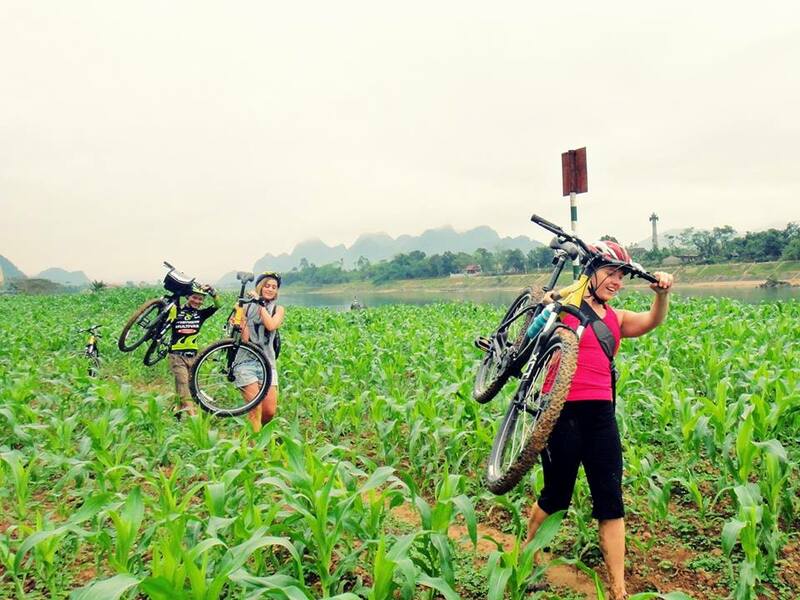 You will see caves, green rice fields, limestone peaks and the rural life of the locals. Your final biking destination of this morning will be your hotel. In the afternoon (following a short transfer by van to the Cuc Phuong National Park) you will visit the Primates Rescue Center. You will then cycle up hills further into the jungle (18km), which is a challenging ride, but worth it once you find yourself in the middle of the jungle, listening to the musical sound of the local birds. Next, you will go back to the comfort of your hotel where you will enjoy the spa and dine in style at your hotel. (You will also have the option to take a boat cruise or do absolutely nothing and simply relax. You will travel by van to Bai Dinh Pagoda which is the biggest pagoda in Vietnam. 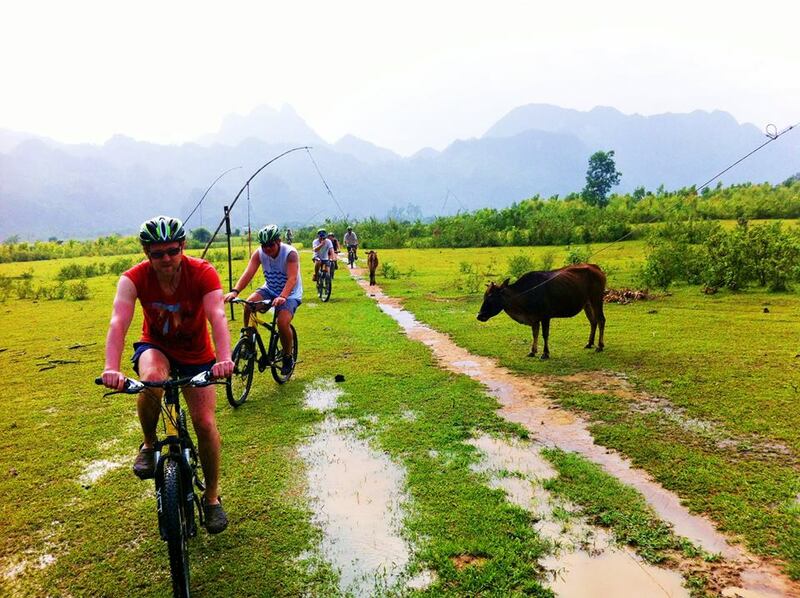 From here you will start cycling on the countryside road to Hoa Lu, an ancient citadel of Vietnam dating back to the 10th Century. You will stop here in order to visit Dinh and Le Temples, as well as Nhat Tru Pagoda or the One Pillar Pagoda which is reached on foot. 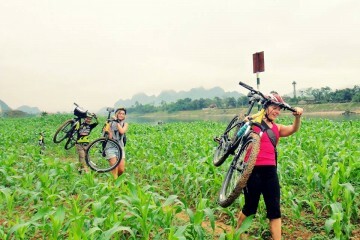 Then you will continue riding through the limestone peaks to Tam Coc, passing rice paddies and rural villages. You will have lunch in Tam Coc near the boat pier before continuing biking to explore Tam Coc, Thai Vi Temple, Bich Dong Pagoda and more. 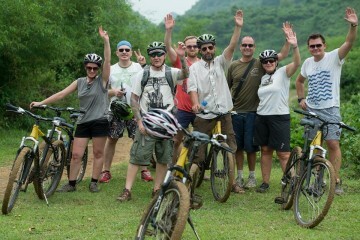 At 4 pm we will load your bikes on our van and take you back to Hanoi, arriving around 6 pm. This itinerary allows for 2 days on the cycling section. You will be able to decide for yourself at any time during each of these days how far you want to cycle. Average daily cycling distances are approximately 40 -100 km. These distances may vary according to weather, road conditions and group fitness and preferences. This is a sightseeing cycle tour, not a marathon or time trial.